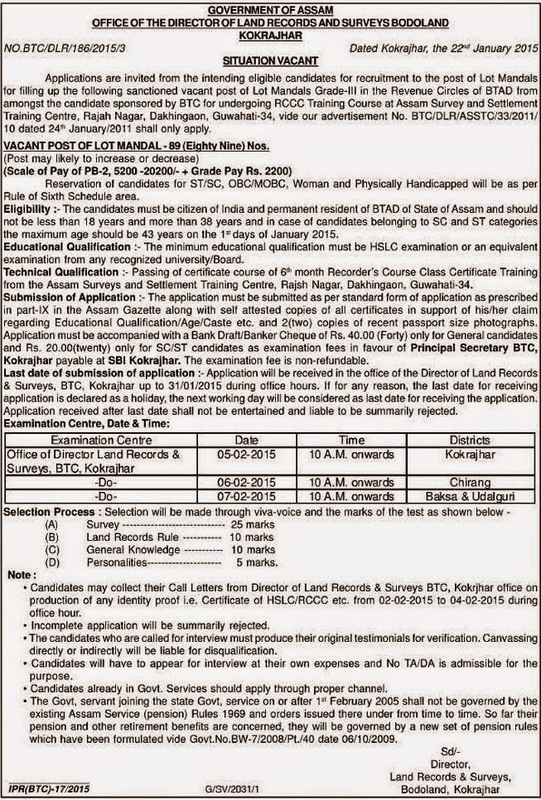 Applications are invited for jobs from the intending eligible candidates for recruitment to the post of Lot Mandals for filling up the following sanctioned vacant post of Lot Mandals Grade-Ill in the Revenue Circles of BTAD from amongst the candidate sponsored by BTC for undergoing RCCC Training Course at Assam Survey and Settlement Training Centre, Rajah Nagar, Dakhingaon, Guwahati-34, Assam. Name of Post: Lot Mandal. (i) The minimum educational qualification must be HSLC examination or an equivalent examination from any recognized university/ Board. (ii) Passing of certificate course of 6 month Recorder’s Course Class Certificate Training from the Assam Surveys and Settlement Training Centre, Rajsh Nagar. Dakhingaon, Guwahati-34, Assam. Pay Scale : Rs. 5200 to 20200/-, GP - Rs 2200/-.